How Does the K910B Buster Stand Out Among Other Contraband Detection Equipment? Contraband detection has become something that is needed more than ever by our law enforcement agencies. Police officers suspecting transportation of contraband and customs agents, among others, find that the Buster K910B Density Meter is an excellent tool for ascertaining the truth of a potential contraband smuggling situation anywhere in the United States. The device is often considered the “gold standard” for contraband detection. The creator of the Buster, Patrick J. Campbell, has been designing equipment to detect radioactivity and hidden things for over 35 years. The equipment he manufactures is easily used by people with no technical experience. He worked with the government, the Border Patrol, and US Customs to design the Buster density meter. While he originally meant it to find cash and controlled drugs, the end result turned out to be effective for these as well as other contraband. The Buster K910B Density Meter is manufactured by Campbell/Harris Security Equipment Company. It emits a low intensity gamma radiation and detects scintillation, allowing it to scan quickly and return a result regarding hidden contraband in just a few minutes. A vehicle can often be checked in under five minutes, and it can scan most rooms of average size in under ten minutes, making this a very efficient device. Other devices available for detecting contraband, most notably ones that use millimeter or radio wave, or ultra-violet or microwave, are viewed as inferior by some professionals due to their limitations. The primary limitation of these devices is the fact that each meter is made to handle one kind of shielding material. The Buster, however, can scan through wood or metal or plastic – even reinforced plastic. It is easy to catch hidden items without causing damage to the items in which they are hidden. The Buster K910B Density Meter also has an audio response as well as the LCD video readout. The device is made to find narcotics, cash, explosives and weapons. It is also possible to get to previously inaccessible areas by adding the optional telescoping handle. Radioactive material is indicated on the Buster, allowing first responders to know immediately how dangerous the area is, and have a better idea of what might have happened. This allows a safe perimeter to be formed so people can be kept from harm. CSECO’s Buster K910B Density Meter is being used by such agencies as the US Customs and Border Patrol, the Department of Homeland Security, the National Guard and Coast Guard, the Drug Enforcement Administration, and law enforcement agencies in local, state, federal, and international locations. The main thing that sets the Buster K910B apart from its competition is the fact that it is very user friendly. CSECO guarantees their units and offers training to anyone who purchases these devices. CSECO can be contacted by email at info@cseco.com or by phone at 510-864-8010. 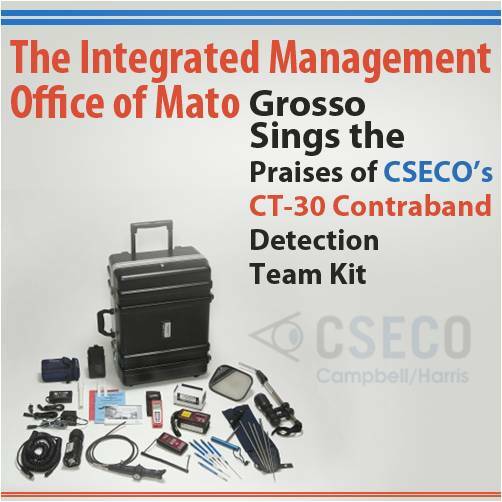 The Integrated Management Office (IMO) of the State of Mato Grosso, the largest state in the country of Bolivia, recently tested the CSECO Contraband Detection Test Kit. They used the CT-30 Kit from April 16 to May 27 and had the following comments. All comments in parenthesis are taken directly from their official report. The CSECO Buster is “very useful for inspections which require speed without room for error in a maximum of five minutes for the parts of the vehicle to be inspected, without having to disassemble anything in places where materials of contraband are found.” Contraband could be money, electronic equipment, weapons or illicit materials. They went on to explain that the Buster could be used at night due to the reflector light that is built into the display which makes it possible for the user to clearly see their results. The report also stated that the Buster was easy to use and that “anyone with minimal instruction is capable of utilizing the Buster.” They also liked how robust the instrument was in case it was accidentally dropped, but since the Buster includes a strap which users can wrap around their wrist, there was no reason for the equipment to be dropped. The CT-30 Contraband Detection Team Kit also includes the FV-Series Fiberscope. The report went on to say that when the Buster was not applicable, they used the fiberscope which is a “long range instrument used when we need to inspect small entrance holes in order to find something hidden, for example: vehicle air conditioners, internal door parts of vehicles and even the fuel tank.” Since the cable is coated with a resistant material, combustible fuels like gasoline, ethanol or diesel do not damage it. The fiberscope made it possible for those testing the contraband detection equipment to inspect all of these places because the fiber optic lights. Other aspects of the fiberscope the IMO found helpful was the articulated movement of the tip which enabled them to search deeper into the air conditioning ducts of vehicles. They felt this helped reduce the amount of certain types of contraband smuggling down to zero. Along with the articulated tip, they tested the optional photographic camera which allowed them to take photographs periodically during the inspection, giving them photographic proof along with a way to digitally store the evidence. The extension provided with the kit allows officers to reach at least 1.5 meters further, enabling them to penetrate the bottom of a load of food to see if other items are underneath. With the orifice, it also allows the officer to more easily identify any other materials that are transported with the food. The CT-30 kit also includes smaller inspection tools, about the size of a pencil that can be carried by police offers and used to inspect smaller cargo. Other tools include a pair of pliers, hacksaw, scissors, Philip’s screwdriver, a can opener and mini flashlight. This small tool kit is easily portable, able to hang from the police officer’s belt, which will provide the tools needed if it is necessary to disassemble equipment. An extension mirror is also included in the CSECO CT-30 Kit. Their police force already uses a similar tool, but the CT-30 Kit extension mirror includes a flashlight that is attached to its base. They noted this tool is “ideal for performing inspections on top of a tall car and also at the bottom of vehicles.” The mirror also can be extended to 1.5 meters.